It’s been nine months since André Borschberg emerged, stiff-legged, from his record-breaking, 117-hour stint aboard Solar Impulse. Not that you’d notice. In his first training flights of 2016, Borschberg appeared completely at home. 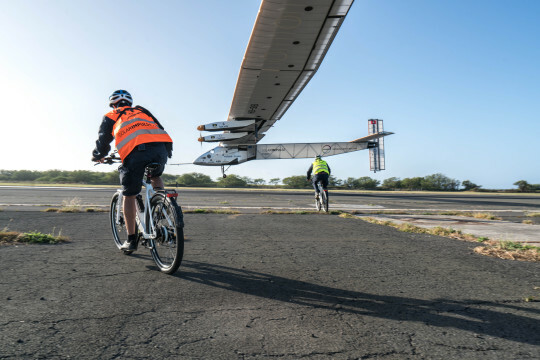 Solar Impulse rounded out what has been a busy month of flying with three flights on March 31, bringing the grand total of take-offs this year to 12. During a morning visit to the offshore test box, Borschberg carried out a variety of aircraft handling tests, reaching a maximum altitude of 7,200 feet and flying for a total of 1 hour, 43 minutes. He was having such a nice time during the evening session - focused on after-dark take-offs and landings – Lead Mission Engineer Michael Anger, the Capcom for this flight, had to talk him into making a final landing. This evening in Hawaii @andreborschberg showed again with @solarimpulse special training how fabulous a pilot he is ! With days growing longer and the mid-April start date for mission readiness only a few weeks away, excitement is ramping up amongst members of the team. Next on the agenda is a longer training flight with Bertrand Piccard at the controls, which will take place as soon as there is a good weather window. Wish for sun and subscribe for updates. Ho'omaika'i'ana (that’s congrats in Hawaiian) Andre! It’s good to see our co-founder back in the Hawaiian skies.